Haven’t made your Valentine’s Day plans yet? Here’s a fun and FREE activity the whole family can enjoy: check out a Zuzu Acrobats performance at Metropolitan State University in St. Paul and enjoy a FREE dinner beforehand! 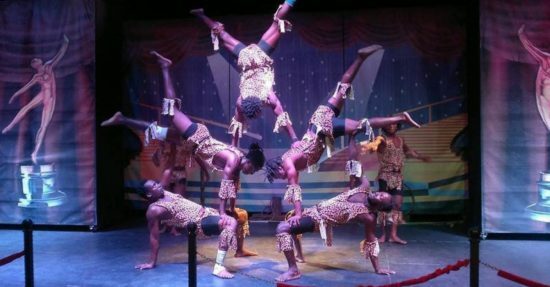 This high-energy acrobatic group from Kenya appeared on America’s Got Talent a few years ago. The performance takes place from 7 – 8 pm at Founders Hall, and the dinner will be served in the Great Hall, New Main from 5:30 – 6:30 pm. The Zuzu Acrobats is a high energy acrobatic group from Mombasa Kenya and known for high energy pyramid building, chair balancing, hat juggling, comedy, super-fast skip rope and hoop diving. The group was a semi-finalist on “America’s Got Talent,” has appeared on “The Late Show with David Letterman,” and will be performing at Super Bowl LIII in Atlanta. There will be a dinner in the Great Hall, New Main, preceding the performance. The event is free and open to the public. No RSVP or registration necessary. The event is sponsored Multicultural Affairs, Student Success, Dean of Students, Equal Employment and Diversity, Marketing and Communication, Institute for Community Engagement and Scholarship, Public Safety/Security, Student Life and Leadership Development and TRIO.